Crafty Fox market has been supporting emerging designer makers and artists since 2010 by showcasing them at their fairs. They mainly run events in and around London, but can occasionally be found further afield. Timeout describe the market as, "One of London's best markets" and I agree! I remember going to early Craft Fox markets when I lived in Brixton and always being super excited to see the diverse talent exhibiting their work there. So I was pretty stoked to be selected to join the lovely Craft Fox crew last Saturday and have a little Albaquirky stall in South London at the Mercato Metropolitano. You can see I brought my favourite feline model (he’s called Herman) and he is doing his best to upstage me by wearing as many upcycled fabric bead necklaces as he can. He’s such a show off! I also brought quite a few new products to debut at the fair and all the old favourites like my large wool scarves, statement necklaces, totes, notebooks and monochromatic tea towels. I have been working on a new upcycled jewellery and accessories range called ‘cute as a button’. I hand make pretty, little silk cotton covered buttons using my drawings and designs. These are then transformed into pin badges, hair clips and earrings. I also have new A3 Art prints and greeting cards. I got such a great response to these new products at the market. My ‘cute as a button’ earrings were my biggest seller, with some people going for the smaller 19mm size and others going for more of a statement with the larger 28mm size. One proud owner of some new earrings, doing a little impromptu modelling for us at the market! These are the larger 28mm size. Thank you to my stall buddy Hairy Jayne for the product swap, modelling services and being such great company. Thank you to everyone who came along and said hello on the day, it was so nice to hear all your lovely feedback on the products. 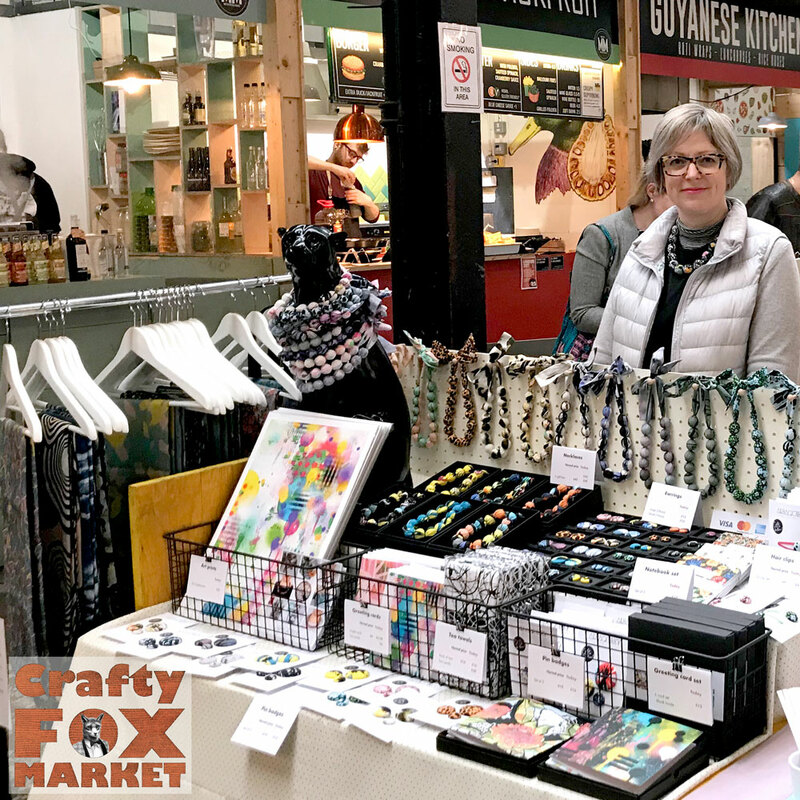 We are back again in the Mercato Metropolitano for the next Crafty Fox on Sat 4th May, we hope to see some of you there again!